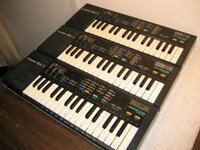 3 SK-1s on eBay, claimed to be non-working. The seller is putting up these 3 non working SK-1s for anyone who is willing to “Tone Bend” them. My guess is that with some troubleshooting skills and good cleaning of the battery terminals they will work again. The bid is at $1 with Ireddi laying down the foundation for what looks to be a bloody bidding war.